Sabertooth Dual 5A Motor Driver for R/C is a dual motor driver specifically optimized for use in radio controlled vehicles. It is suitable for small robots, cars, and boats, and especially well suited for the Antweight and Beetleweight classes of fighting robots. Out of the box, it can supply two DC brushed motors with up to 5A each. Peak currents of 10A are achievable for a few seconds. Overcurrent and thermal protection mean you’ll never have to worry about killing the driver with accidental stalls or by hooking up too big a motor. This R/C version comes with an invert channel and options for exponential control, autocalibration, and built-in mixing. The operating mode is set with the onboard DIP switches so there are no jumpers to lose. 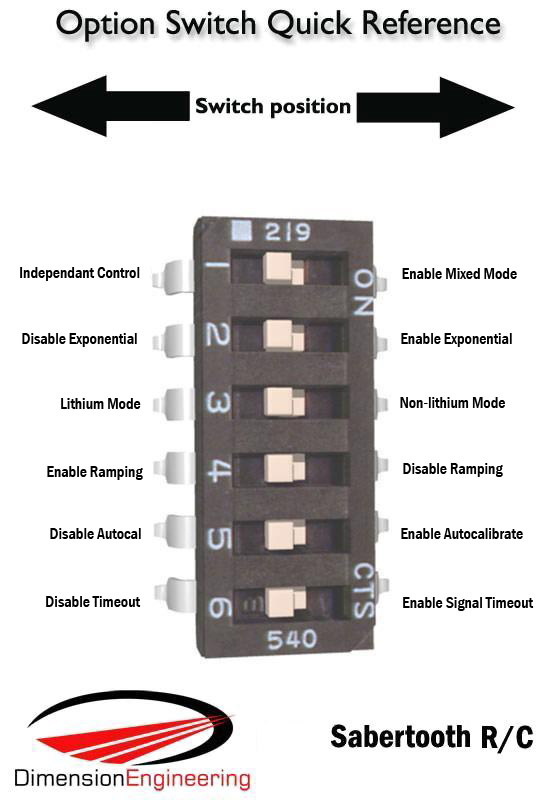 Sabertooth is the first synchronous regenerative motor driver in its class. The regenerative topology means that your batteries get recharged whenever you command your robot to slow down or reverse. Sabertooth also allows you to make very fast stops and reverses – giving your vehicle a quick and nimble edge. Sabertooth has a built in 5V BEC that can provide power to a microcontroller or R/C receiver. The lithium cutoff mode allows Sabertooth to operate safely with lithium ion and lithium polymer battery packs – the highest energy density batteries available. Sabertooth’s transistor is a switch?at ultrasonic speeds (32kHz) for silent operation. Use of this motor drivers with cheap AC adapters is not recommended. Use a battery or at least put a battery in parallel with a DC supply. Need more power? Take a look at?Sabertooth dual 12A motor driver for R/C?